Gariep Gardens - Gariep and Dam Accommodation. Gariep Gardens Guest House is situated in the Gariep Dam holiday village and is approximately half way between CT and Johannesburg and only a 5 minute drive from the N1 Highway. Gariep Dam Village was voted tourist town of the year in 2010. Exciting and yet crime free. It is the ideal place to break your journey and enjoy the most beautiful surroundings as well as the crisp clean air of the Great Karoo. Ideal for the weary travellers or those wanting to break away from the city rush! Take a minute to look up at the clear night skies and realize that this is truly a special place. Trillions of stars, see the "milky way" and hear the silence and enjoy!! Gariep Gardens is appropriately named due to its lush gardens, vines, fruit trees and stunning pool and lapa's. It is absolutely ideal for the weary guest looking to break their journey - or those just wanting to break away from the city rush and spend some time enjoying the activities the area has to offer. Gariep Gardens is made up of 3 very private, yet different units with each unit having its own parking bay and access to the fully enclosed pool and lapa area. Each unit has its very own private Lapa and braai area and we certainly believe that Gariep Gardens has the best that Gariep Dam has to offer. Comfort and style and privacy under lush gardens Enjoy superb Water sports, Yachting and Fishing or fly at South Africa's number one Microlite & Gyro paradise, Gariep Dam, from the comfort of Gariep Gardens - Self Catering Accommodation. Gariep Dam holiday village is just thirty kilometres from Colesberg and is situated next to South Africa's largest dam, in the heart of the country. Gariep Gardens is acknowledged as one of the premier self-catering establishment in the area with some guests giving the Cottage a brilliant rating and other guests claiming it's the best value for money guesthouse in South Africa. There is a strict "Non Smoking" rule in all the units; however, smokers are encouraged to smoke outside. A "No-pet" policy applies to all Gariep Gardens units. Rates are inclusive of electricity, linen and Towels. Due to the high quality of the White towels provided in the rooms, these towels are not to be used at the Swimming Pool area. Riedier can accommodate 2 guests. It consists of a bedroom with a double bed. The bathroom is separate with a shower, basin & toilet. The lounge has a T.V. Reider unit also has a large separate kitchen and entertainment area that has a build-in braai with an inter-leading door to your private outside lapa and braai. Ting Tinkie can accommodate 3 guests. It consists of 2 separate bedrooms. The main bedroom has a king size bed and an on-suite bathroom (shower, basin & toilet). The second bedroom has a single bed with a basin in the room. The large lounge has a flat screen T.V. that inter-leads to the kitchen. Inter-leading door to your very own private outside lapa and braai. Blue Crane can accommodate 4 guests. It consists of 2 separate bedrooms. Each bedroom with two single beds and a separate bathroom (bath, basin & toilet). There is an open plan kitchen, dining room and lounge with a T.V. All rooms have air conditioners, fans and heaters. 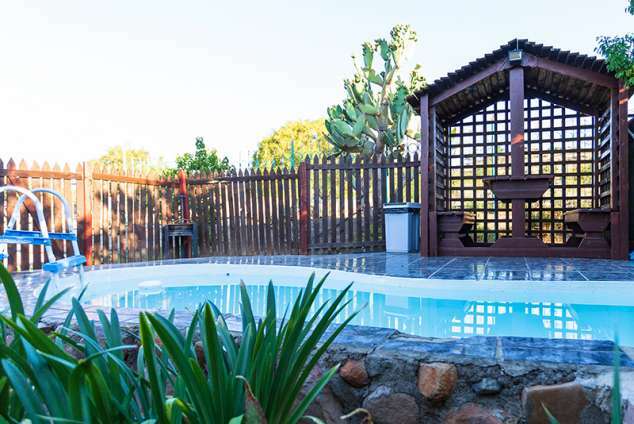 Your very own private outside lapa and braai, close to your parking and next to the pool. Truly a home away from home! From the N1 take the exit toward Gariep Dam (R701), stay on the R701, turn left onto the R33 (the Quest garage is now on your right), first right into Tinktinkie road just when you have past the Quest garage, turn right at the crossing into Jangroentjie road, first left into Rooibekkie road, first right into Bokmakierie road, first left into Berghaan road. Gariep Gardens is the last house on your right-hand side. 7344 page views since 24 Jan, 2013.